Home / Pets / What Can I Give My Cat for Pain After Being Declawed? What Can I Give My Cat for Pain After Being Declawed? Also called onychectomy, the procedure for declawing a cat can be stressful. Not only the lead-up to the operation, but the recovery process, when your cat won’t be her usually self. The last thing you want is to see your pet in pain and stressed out. 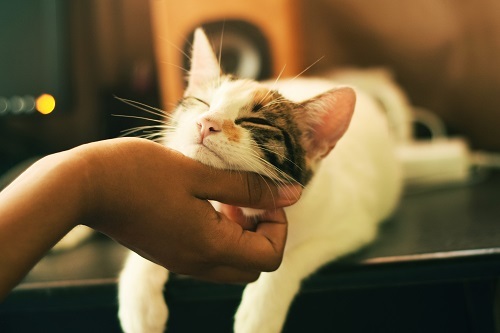 So what can you give your cat to relieve his or her pain after being declawed? Keep in mind that declawing is essentially an amputation, defined by the American Veterinary Medical Association as a “major surgery.” Therefore, it should not be considered a routine operation. And your cat’s mobility will likely be diminished for a period of time during recovery (at least a couple weeks, more than a month in some cases). Before showing you some of the best “cat declaw products” and other helpful cat solutions, here are a few suggestions to consider for the recovery process. This point can’t be emphasized enough. Although your vet probably already warned you… Once you get your cat declawed, it’s time for her to move indoors – permanently. Not only is it critical during the healing process, but without claws, a cat is not able to adequately defend itself. This is especially important when you have dogs or other pets that roam throughout your house. Because one of the last things you want is for another animal to lick or groom your cat’s paws while they are trying to heal. While you might be hesitant to leave her in a small space – like a bathroom or bedroom – you can make it a little more “homey” by moving in her food, water, litter box, toys, and extra comfortable bedding. Some felines really like to stay active. After a declaw procedure, they tend to be a little more relaxed. But sometimes they do feel compelled to run and hop around. This, of course, is one of the last things you want. Try to monitor your cat’s behavior and when she seems like she is getting ready to jump or rough house, try to intervene quickly. This isn’t an easy one, considering the last thing your cat is going to want is you messing with her paws. But it’s important to keep them clean to prevent infection. Even tiny pieces of litter can be a concern, as they can get inside the paw and cause an infection. Wipe her paws gently with a soft, warm cloth to keep them clean. After undergoing an onychectomy, it may be painful for your cat to step on the litter you typically use. This can often lead to your cat relieving herself outside the litter box. It’s not necessarily out of defiance. It’s simply uncomfortable. A good suggestion is to use clumping litter, as its fine texture can relieve discomfort of a cat’s paws. Cosequin capsules: These capsules play an integral role in maintaining optimal joint function. Designed specifically for cats, cosequin can help improve the declawing recovery process. Cat hemp oil: Cats can become anxious for a variety of reasons. Getting declawed can be a big source of anxiety for our furry little friends. This product can also work as a natural pain reliever.